Whether your friend or loved one is onto bullet journaling, getting things done, the pomodoro technique, are a freelancer or are just getting started on their productivity journey there’s something for everyone in our Christmas 2017 Productivity Gift Guide. The links aren’t in any particular order and we’ve tried to get something for everyone on this list but if there’s something you think we’ve missed then feel free to email us the link. Please Note: This post contains affiliate links. You won’t be charged any extra for shopping through these links but I may receive a commission on any purchase you make – this goes towards helping run this website. The following products are suggestions only, other products are available and these have been chosen to give you an idea of items that are available. 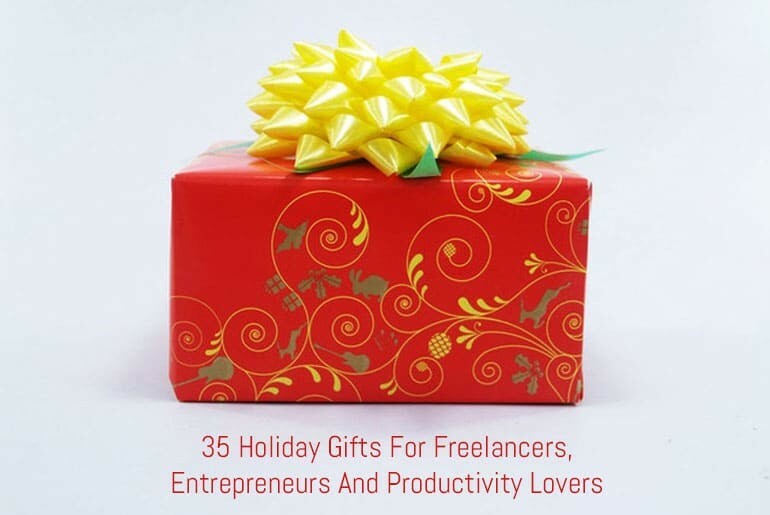 Now, let’s help you find the perfect present for the productivity lover in your life. The art of writing seems to be disappearing with an increased reliance on technology so give the gift of handwriting with this book and pen set. Sticking with writing – I love these pens! They manage to make my handwriting super neat, which is no mean feat. There’s a great selection of colours as well so whoever you give these to will be set whatever they want to use them for. If your fried or loved one is a fan of planning but hates having to copy notes from book to book, or is worried about running out of room then they may be looking at using a Traveller’s Notebook. If that’s the case then you can’t go wrong with these great inserts from The Chelsea Paper Co.
I’ve not recommended a planner cover as that’s quite a personal choice but this is the Travellers Notebook Cover that I’m going to be using for 2018 along with the Chelsea Paper Co. Dot Grid inserts. When setting up your planner for the next year, you might want to include a monthly calendar on your pages. Drawing these by hand can get repetative and you run the risk of maing mistakes so that’s where these handy stamps come in. If you don’t want to write out each of the days of the month, or perhaps you have an older planner and would like to use it but the dates on the days are incorrect, you can amend the dates with these colourful date dot cover stickers. We’re all told to try an eat a healthy, balanced diet but sometimes it’s difficult to keep a track on what we’re eating – and whether we’re eating well enough. These meal planning stickers are perfect for you to stick in your planner so you can keep track of your meals and make sure you’re varying your diet and getting your five-a-day. When I really get into writing an article or doing some complex coding, I quite often forget about the coffee that’s sat by the side of the keyboard. If you know someone who loves a cup of tea or coffee but are forever complaining about it going cold then this is the perfect gift for them. Whether they’re a blogger arranging interviews and publication dates or a freelancer managing a schedule, there’s some about having everything laid out on paper that they will appreciate. Know someone that’s moaning about not having enough room on their desk? Or perhaps they’re always losing their pens? Then this great desk organiser will help keep all their stuff organised. Ideal for the casual artist or budding graphic designer, a tablet allows them the freedom to put their ideas onto their computer without the need to draw and scan them first. If the person you’re buying a gift for is into working late at night then help them get a restful sleep with these blue light blocking glasses – perfect for late night computer and phone/tablet users. The perfect gift for those on the go. A laptop bag with portable charger holder, headphone socket and a lock to secure their tech is a must for the freeelancer or entrepreneur on the move. If you know someone wo likes to snack at their desk, then this mini vacuum cleaner will help keep they keyboard crumb free. If a mini vacuum cleaner won’t cut through the mess that your friend makes, then perhaps a keyboard that you can put through the dishwasher is a more suitable gift! If your gift recipient is into paper planning but you think they should be moving into the digital world then how about a planner that lets them digitise their written pages? Whiteboard Sticker Wall Paper Self Adhesive Large Whiteboard Wall Paper Dry Erase Message Board Wall Decal Peel and Stick Wallpaper for Home Office School with a Free Marker Pen, 17.7" x 78.7"
They can put a whiteboard anywhere with this whiteboard sticker paper – they’ll never forget an idea again as they can jot them down with ease. Know someone that struggles with making decisions? Then let their paperweight make all the tough choices for them! If someone is getting a bit stressed at work, help them relax with this minature Zen Garden set. I was going to include a bonsai tree but as I have managed to kill 3 of them I thought it best not to! What better way to help someone increase their productivity than to get them a personal assistant? Whether they use it to set reminders or to play their productivity playlist, the Amazon Echo can help them get more stuff done. It’s difficult to find the time to sit down and read, so give someone the freedom to listen to books on the daily commute – they have no excuse not to learn something new, or catch-up on all the books they’ve missed on on. I don’t know about you buy my good ideas always seem to strike when I can’t write them down. Help out the whole family with this waterproof notepad – no one will have an excuse for forgetting that great shower idea again! Know someone who’s always running out of battery on their phone as they’re using it constantly? The let the charge it on the go whilst carrying their cash and cards around in style too. Allow them to set the right type of lighting for the job their doing with some adjustable lightbulbs – they can even control them through Amazon echo so they don’t have to leave their seat when they’re “In the zone”. I don’t know about you, but I have no idea how my cords and cables get tangles when no-one even goes near them. If you know someone that has to carry a lot of equipment around then help them out with a cable and gizmo organiser so they’ll never have to deal with tangles again. We’re being told to hydrate more so help someone get their daily water intake with a great bottle that magically keeps stuff hot or cold! If someone loves watching movies on their phone, or perhaps they have to do presentations out of their office then a mini-projector is just the portable bit of tech they need. If they deal with a lot of documents, or love to write on paper then get the the gift of digial organisation with a portable scanner. If they love to take photos on their phone but love jounaling, then a portable photo printer is the ideal gift for allowing them to keep a physical reminder of their memories. This is the book that sparked my journey into productivity. I highly recommend this for you, or anyone, looking to get into productivity but don’t know where to start. Marie Kondo’s “The Life Changing Magic Of Tidying Up” caused quite a stir when it first came out. Give the gift of decluttering with her follow-up book “Spark Joy”. I’m still not 100% convinced that Tim Ferriss only works 4 hours a week, and I know that the system won’t work for most people. but the books certainly gave me a lot of ideas about streamlining my processes and paring down what I need to work on. So, if you know someone who is struggling with the amount of work they have on – maybe this book will help them simplify their work lives a little better. This book is on my list of things to read in 2018, so if you know someone who is drowning in emails or never seems to be able to cross evertyhing off on their to-do list then perhaps they need to learn the ways of the Productivity Ninja.